Last week I was working on an Eclipse project which requires me to create one executable .sh (shell script) file. 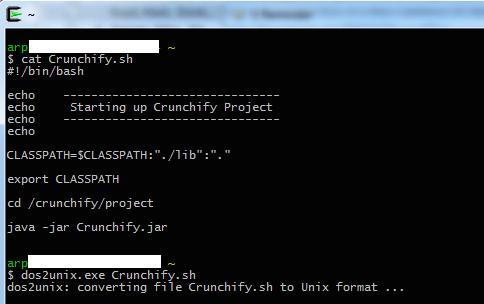 Here is a content of Crunchify.sh file. I was working on Windows environment so during deployment I copied all my project files to Linux dev box. While running I got this strange error. After scratching my head for almost 10 mins found an issue with file format. File wasn’t correctly created with UTF-8 and Unix format. dos2unix includes utilities to convert text files with DOS or MAC line breaks to Unix line breaks and vice versa. It also includes conversion of UTF-16 to UTF-8. Above solution works perfectly for Windows user but what if you are running your development on MAC OS X. Well, there is a simple trick for that too. 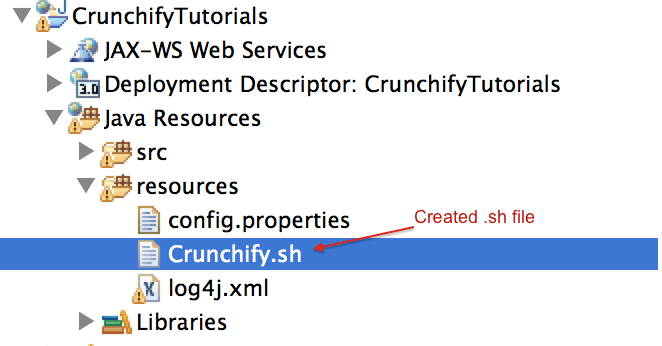 Where Crunchify.sh is the file that has the Control+M characters at the end of the line, and Crunchify2.sh the new file you are creating! NOTE: Try using a different name for the target file. Hope this help. Enjoy and Happy coding. Good info. BUT, how did you identify the file as being in DOS format? When I do a CAT of the file, I don’t see any ^Ms. In VI a little [dos] marker shows up at the bottom. Otherwise, how do you identify. The WINSCP I use was supposed to strip those from text files going to UTF-8. I also don’t know how to find out by looking at just file name but I would use below command to find all files with ^M in it. Here ^M is a single CTRL-M character, not two characters. This uses the more atrocious filenames with spaces in them friendly options and only finds carriage returns immediately before the end of line.